How familiar are you with fluoropolymer tubing? Did you know it has numerous applications or that there are several different variations of it? Well, today you're about to learn a little more about this special tubing because it is extremely versatile and used in a variety of ways! This type of tubing provides for a long, continuous length of fluoropolymers that have many distinct advantages like optical clarity and flexibility. Fluorotherm™ has seven different variations of fluoropolymer tubing and the material features low gas as well as permeability properties that also possess superior UV transmission ratings. Read on to learn more about this flexible and versatile tubing. PTFE tubing is the classic and original iteration of fluoropolymer tubing and was invented back in the 1940s. Noted as the 'gold standard' of all types, this version of tubing continues to cover a vast range of unique properties like a high temperature resistance and a nearly universal chemical resistance with non-stick characteristics. Additionally, PTFE tubing is perfect for medical devices, automotive applications, fluid flow tubing, electrical wire insulators and more. FEP tubing was developed in the 1950s and carries over many benefits found from PTFE tubing but also has a few more features like being more optically clear, lower gas and vapor permeability and more chemically inert. Not to mention, FEP tubing can be used in applications where PTFE falls short because FEP possesses a working pressure that is 30% higher with a temperature that is 50 degrees Fahrenheit lower. Also, FEP tubing is more flexible than PTFE and has superior dielectric strength. Following FEP, PFA tubing came to be in the late 1960s due to a need for a resin with chemical and the use of temperatures closer to PTFE. While it tends to be slightly more costly, PFA has many benefits over other kinds of fluoropolymer tubing because it has a higher working pressure capability than both FEP and PTFE. Since it features low off-gassing properties, PFA is ideal for laboratories, pharmaceuticals and sampling applications due to its ultra-high purity grades. Structurally similar to polyolefins, ETFE fluoropolymers provide for a higher abrasion, impact and crush resistance when compared to the above three versions. It's an excellent choice when it comes to housing wiring harnesses and when a high chemical and wear resistance is needed. ETFE is also suitable for applications involving the aerospace industry, architectural needs and both electrical and mechanical uses. Polyvinylidene fluoride fluoropolymer tubing, also referred to as PVDF, is FDA approved for use in water and food applications, which is why it's extremely popular in the food processing industry. Besides its safe use with food and water, PVDF also is very versatile as it can be utilized in industries that use fiber optics, marine tanks, medical equipment and more. Plus, PVDF is UV resistant, impervious to bacterial and fungal growth and has a working temperature range between -50 degrees Celsius to 150 degrees Celsius. 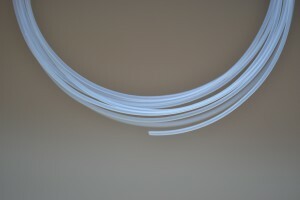 For a unique and exclusive fluoropolymer tubing, the H2 iteration is a trademarked and proprietary product by Fluorotherm™ that combines a special formula based on FEP & PFA resins. This makes for an extremely smooth tubing surface and has 2.7 times higher thermal conductivity than all the above polymers mentioned. Industries that focus on dust control, thermal dissipation and electrical discharge can greatly benefit from the properties found in H2 tubing. When protection is needed for metal and other materials that are exposed to harsh and aggressive environments like corrosion, moisture and other adverse conditions, heat shrink tubing can provide for a protective jacket that's snug and effective. Heat shrink tubing can shield electrical connections, provide an anti-fouling barrier on food, paint and chemical equipment and much more. Depending on which fluoropolymer tubing is used, it can be applied to numerous industries. For instance, in the automotive industry, chemical transference is often needed to deliver vital fluids throughout a vehicle's complex engine. With this in mind, the flexibility and high working temperature characteristics of fluoropolymer tubing can provide custom applications in long lengths on a variety of vehicles. Since fluoropolymer tubing is a fantastic insulator, it can offer electrical insulation and chemical resistance that makes it a great splicing aid for high continuous service temperatures in corrosive environments. On to fiber optics, such tubing is UV resistant and operable in high temperatures, which can house delicate fiber optics while retaining a vast degree of flexibility. 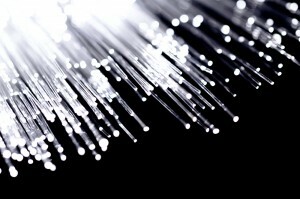 This allows for multiple channels of fiber optics to be encapsulated. Fluoropolymer tubing is an extremely versatile and capable material that has a nearly infinite amount of uses. Are you ready to find the perfect type of tubing to fit your specific application? Talk with a Fluorotherm™ expert today by calling 1-877-777-2629.